Klerksdorp, where a dazed-looking, cut-out Joshua Doore lookalike squints out at the deserted, drivetime streets from underneath a rust-red Russels store sign. 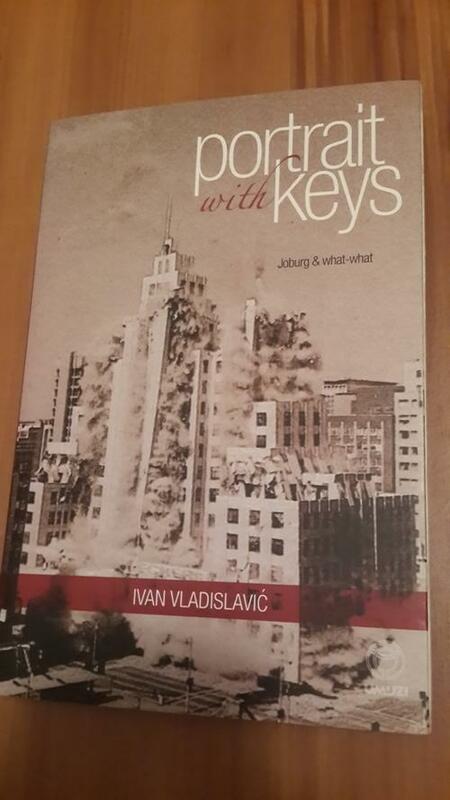 There’s a passage, a succession of two, three tumbleweed hums in Portrait with Keys by Ivan Vladislavic, which I haven’t been able to shake. We ride into Joburg, up her bumpy bellybutton stretch from the South. The book’s slipping from my the womb of my lap. The sun surrenders faraway in the West, the last glowing coal in braai-blue skyline. A road sign winks, she knows we know that we’re on the Golden Highway. Look right. A pair of knowing, shadowless figures look as if their digging up a measured patch of veld to discover, or a small ditch to stash away, some secret treasure. Images aren’t stable in stale brown light of buried pyrite. In a colourless flash the two figures unravel, now morphing into two youths lolling on same patch on farthest side of main drag, faceless under bright peak caps. This is Eldorado Park. Two men at the back of the bus, smacking their lips in tandem, whinge, or whine, about how expensive food and drinks were on the train. Imaginary coins rattle in half sober skulls, causing their eyes to gleam as they sliver into smiles of regret. What passage was it I was thinking about?